The question then becomes how to achieve this transition….. To answer this, the CIO Executive Council partnered with leading global talent firm Egon Zehnder who had performed over 25,000 face-to-face C-level assessments in order to identify the 9 executive core competencies most crucial to C-success. Developing the long-term capabilities of others and the organisation as a whole, and finding satisfaction in influencing or even transforming someone’s life or career. The ability to think long-term and beyond one’s own area involving three key dimensions: business awareness, critical analysis and integration of information, and the ability to develop an action-oriented plan. Understanding the market in which a business operates, including the competition, the suppliers, the customer base and the regulatory environment. Focusing, aligning and building effective groups both within one’s immediate organisation and across functions. Transforming and aligning an organisation through its people to drive for improvement in new and challenging directions. Serving and building value added relationships with customers or clients. Working effectively with, and influencing those outside of, your functional area for positive impact on business performance. Identifying and moving towards business opportunities, seizing chances to increase profit and revenue. Being focused on improvement of business results. Defining the future role and cataloging the competencies that would take ICT leaders there was only a first step. In 2009, Council members pushed for more—they wanted to help the profession make the journey from Functional Head to a Business Strategist. Although a single prescription for advancing the role is impossible because ICT leaders circumstances are all different, members wanted a general roadmap and guidance. Enter…..The Journey to the Future-State framework…. Fortune 500 companies such as Chevron, Bayer, Toyota, Shell, H & R Block and Raytheon. The framework uses the 9 core competencies as the foundation and matches them with the associated 3 CIO archetypes. 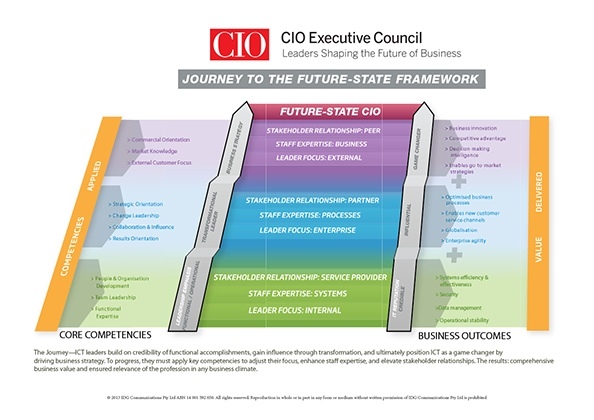 It provides leaders with a roadmap to follow in order to transition into a Future-State CIO delivering strategic, game changing advantage to their organsations.